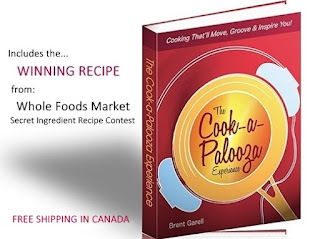 The Cook-a-Palooza Experience: Fall-Off-The-Bone Braised Chicken Legs: "Wow" Them with the Sauce! 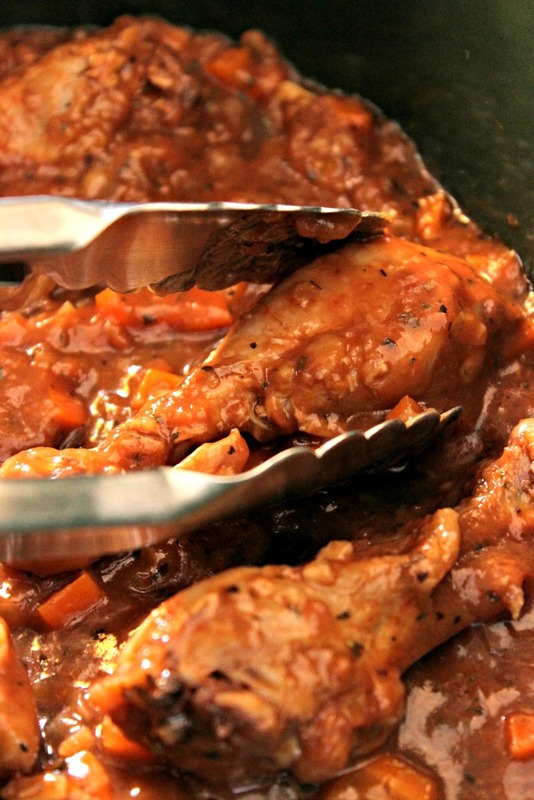 Fall-Off-The-Bone Braised Chicken Legs: "Wow" Them with the Sauce! 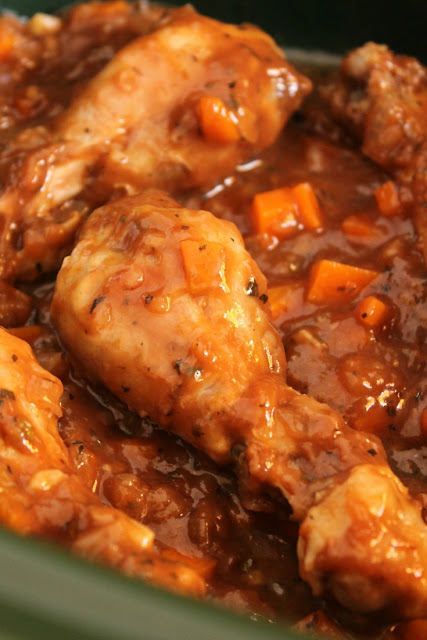 Add an elegant twist to your weeknight chicken dinner by serving these flavorful Fall-Off-The-Bone Braised Chicken Legs with mounds of savory sauce to spoon over top! My favorite way to cook chicken legs is low-and-slow in the slow cooker until the chicken becomes fall-off-the-bone tender. As for the sauce, I love it when it is coat-the-spoon thick! To thicken the savory sauce, I took a page out of the pan sauce section of my Skillet Pro Jumpstart online cooking class, and tossed the chicken legs (minus the skin) in cornstarch, BEFORE browning them in the skillet. Tossing the chicken legs in cornstarch (as opposed to directly adding cornstarch to the sauce) thickens the sauce without it tasting chalky. And browning the chicken legs gives them an appetizing-to-the-eye golden brown color before they go in the slow cooker. Browning the chicken also provides the opportunity to stir any flavorful browned bits at the bottom of the pan into the sauce to make it taste extra delicious! My wife’s response after tasting this savory weeknight meal? "This is really good! How did you make it?”. I wish I could say it is a secret recipe...but it really isn't. For the sauce, I used the ingredients from the Braised Chicken Obsession recipe inside The Cook-a-Palooza Experience cookbook. As for the fall-off-the-bone tender chicken - I can thank my slow cooker for another masterful job at cooking food low and slow. The recipe deets are posted below! 1. 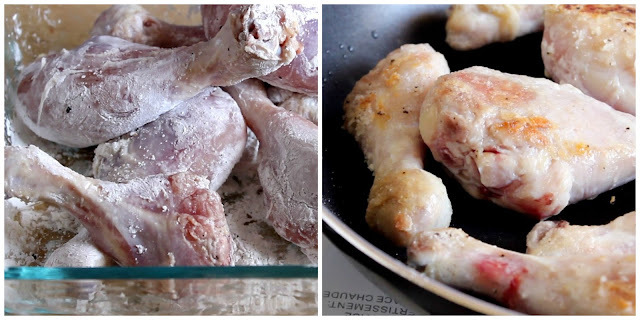 Start by tossing the chicken legs with the cornstarch in a large bowl. Heat 2 teaspoon of oil in your skillet over medium heat, then add six chicken legs to the skillet. Cook until one side of each chicken leg is browned, about 3 minutes. Turn each chicken leg over. Cook for another 3 minutes to brown the other side. 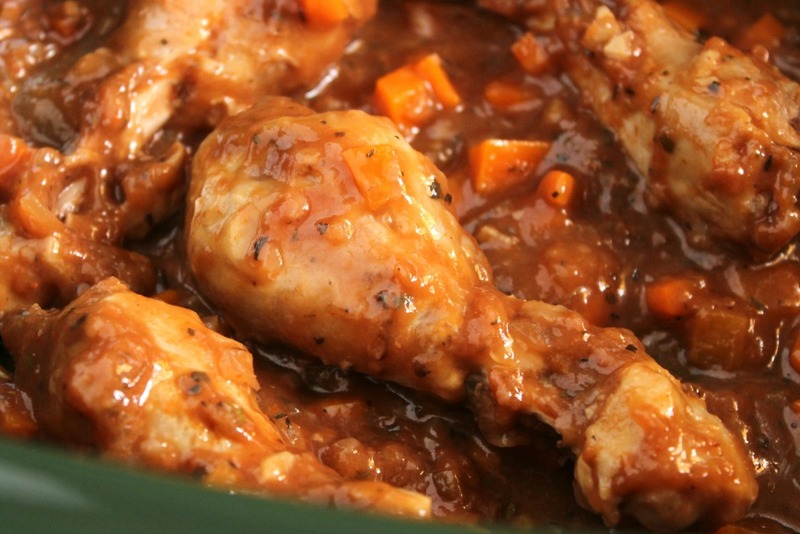 Remove browned chicken legs from skillet and place in slow cooker. Repeat the steps using the remaining canola oil and chicken legs. Place in slow cooker when browned. 2. While the skillet is still hot, slowly pour the chicken broth in skillet. Using a wooden spoon, scrape up any browned bits on the bottom of the pan and mix them into the broth. Stir in garlic, Italian seasoning, tomato paste, white wine vinegar, salt, and pepper. 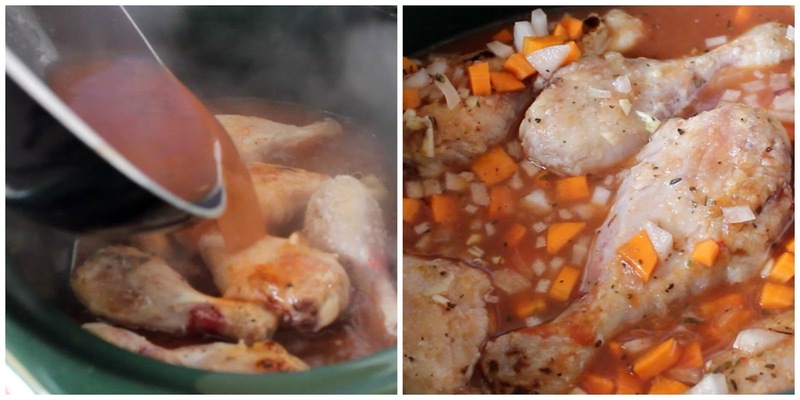 Stir to combine ingredients, then pour the broth mixture over top the browned chicken legs in the slow cooker. Finally, add the onions and carrots to the slow cooker. 3. 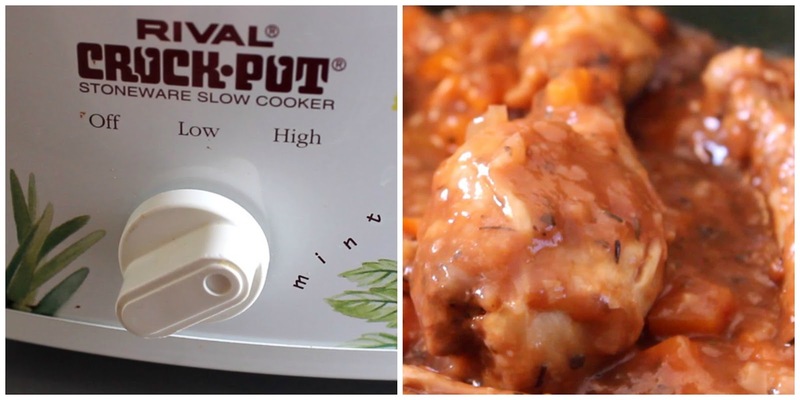 Cover the slow cooker with lid and set to HIGH. Cook until chicken is fully cooked and easily falls off the bone, about 3 to 4 hours. Remove slow cooker lid to allow the sauce to slightly cool and thicken before serving, about 5 minutes. Lightly season to taste before serving. 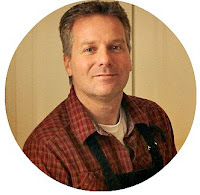 See you back here next Tuesday when I'll have a new and flavorful meal idea to fill your plate - in a snap! Ciao for now! Hi I'm Brent! 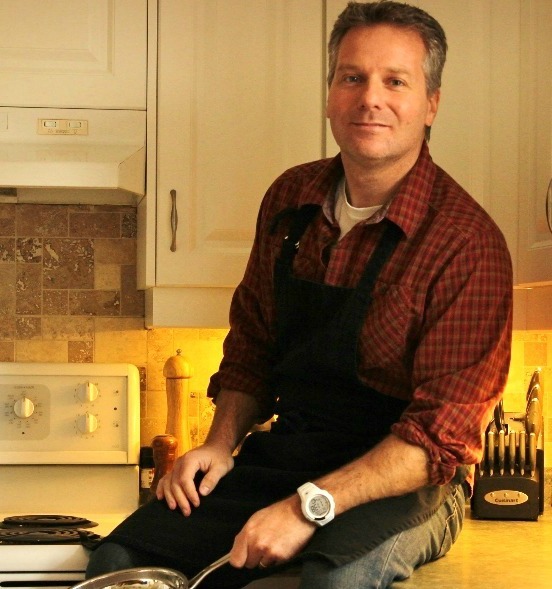 I love when the recipes and cooking experiences I share translate into delicious successes on YOUR plate. In addition to posting recipes here, you'll find me teaching cooking classes in the greater Toronto area and online at Skillet Pro Jumpstart.